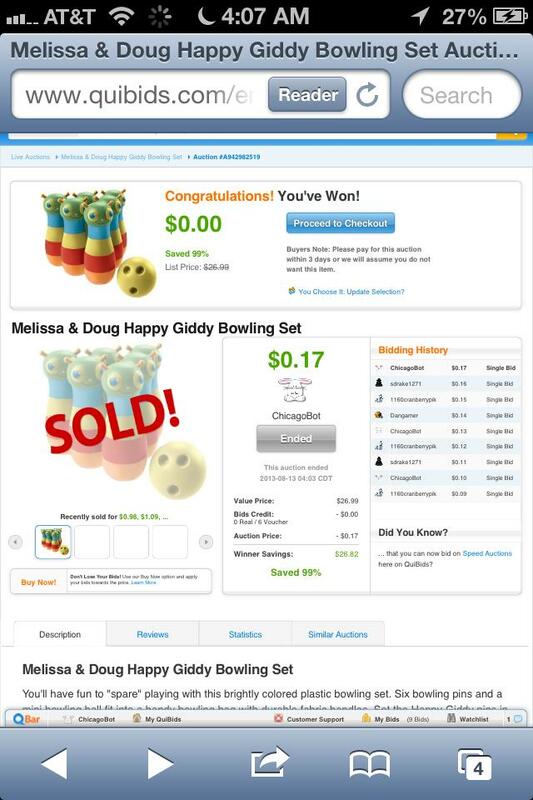 Home / QuiBids customers (and their children) love winning toys. When most people think about QuiBids, they probably think about all of the top-of-the line electronics and appliances available on the site. It’s easy to get distracted by theses flashy, high-end products – cause there’s a bunch. But sometimes bidders can overlook the other, not-as-sought-after products, like these toys and other stuff for kids. 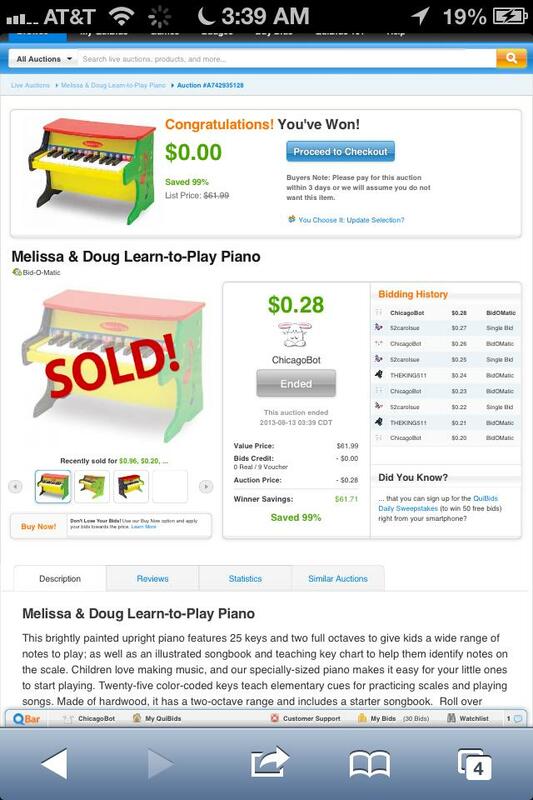 We’ve recently noticed an uptick in posts from customers on our Facebook page sharing their positive experiences with the toys they’ve won on QuiBids, especially the Melissa & Doug brand toys. Enough so, in fact, that we decided to put this blog together so other customers could know about these little gems too. Continue reading to see what people are saying about the toys they’re winning on QuiBids. 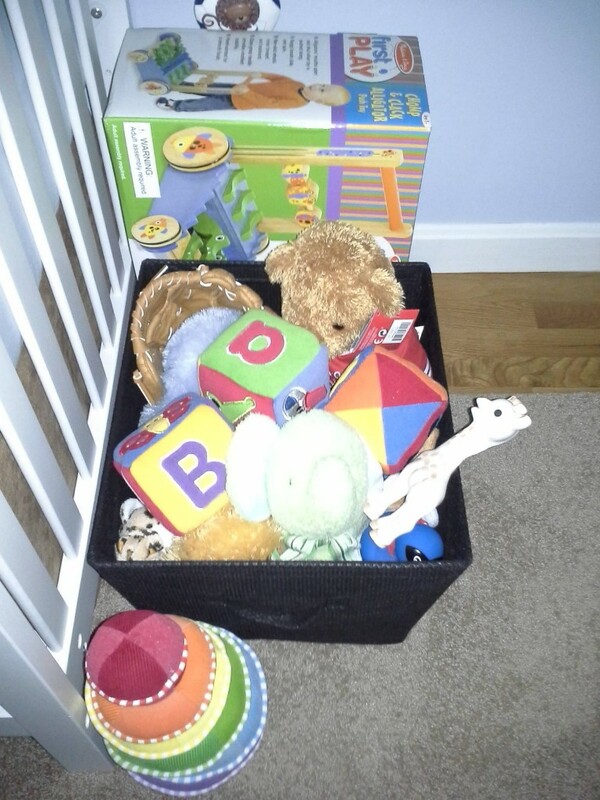 In Elitsa’s two photos below, she shows off an entire corner of her child’s bedroom that she calls her “Q-sponsored Melissa & Doug corner” because they are all Melissa & Doug toys she got from QuiBids. 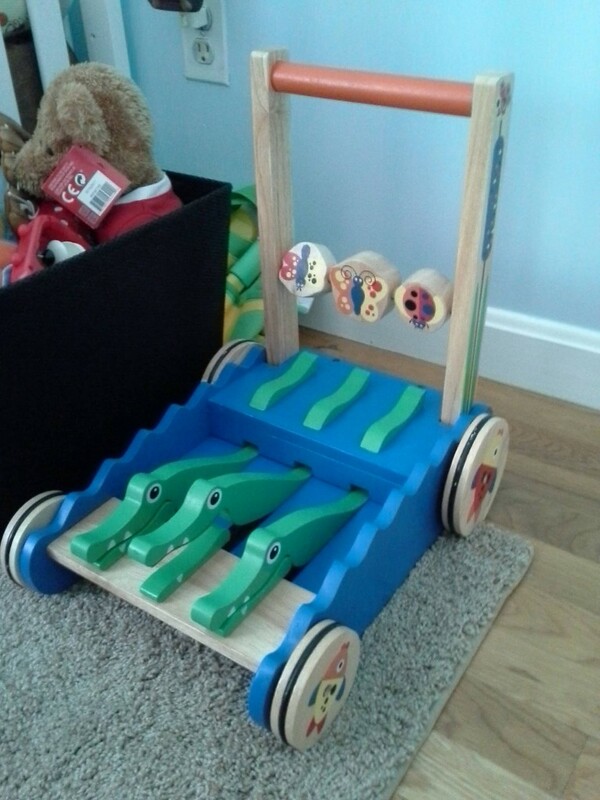 Click here to check out the Melissa & Doug Alligator Push toy, like the one in Elitsa’s photo below. 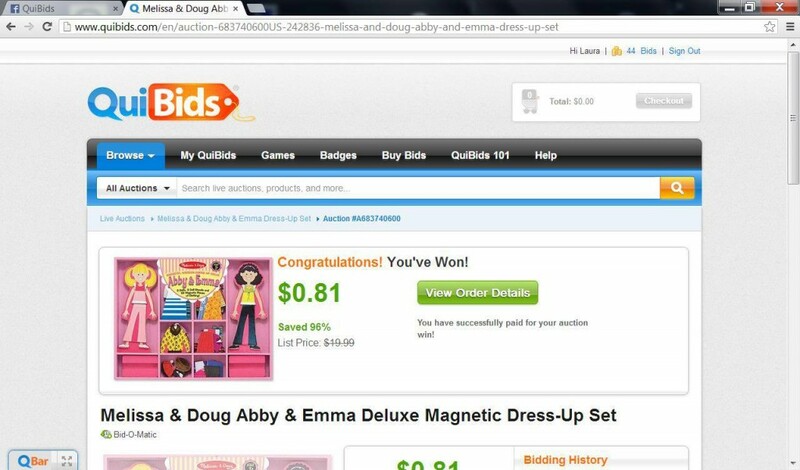 “My son Luke’s Q-sponsored Melissa and Doug corner.” – Elitsa M.
“Here is Luke’s newest toy*” – Elitsa M.
QuiBidder Laura C. couldn’t help but share the excitement after winning this Melissa & Doug Abbey & Emma Deluxe Magnetic Dress-up Set for $0.81. 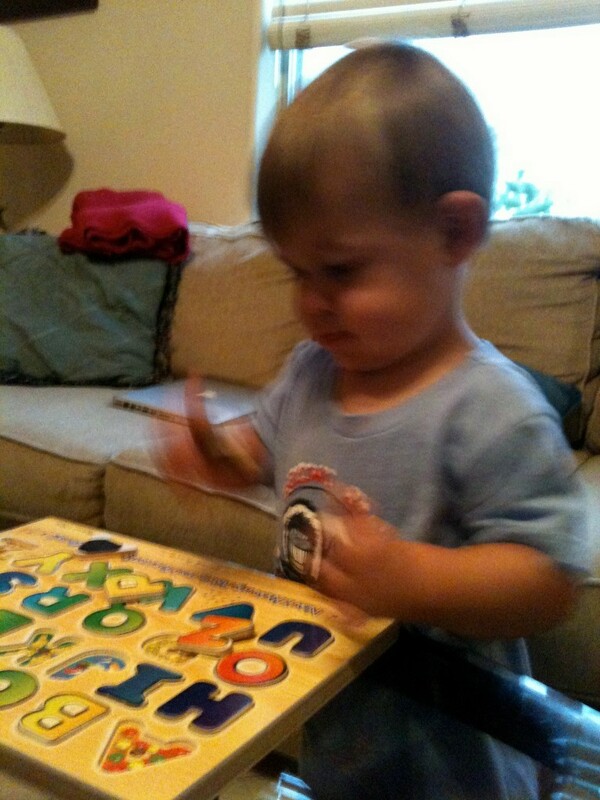 “Another win for today My Granddaughter will be very happy!” – Laura C.
Karen won this Melissa & Doug Alphabet Sound puzzle for $0.89, and she claims it is a “hit” with her grandson. Go here to start bidding on one for yourself. “The Doug and Melissa Alphabet Puzzle is a definite “hit.” It arrived yesterday just in time for today’s new activity. 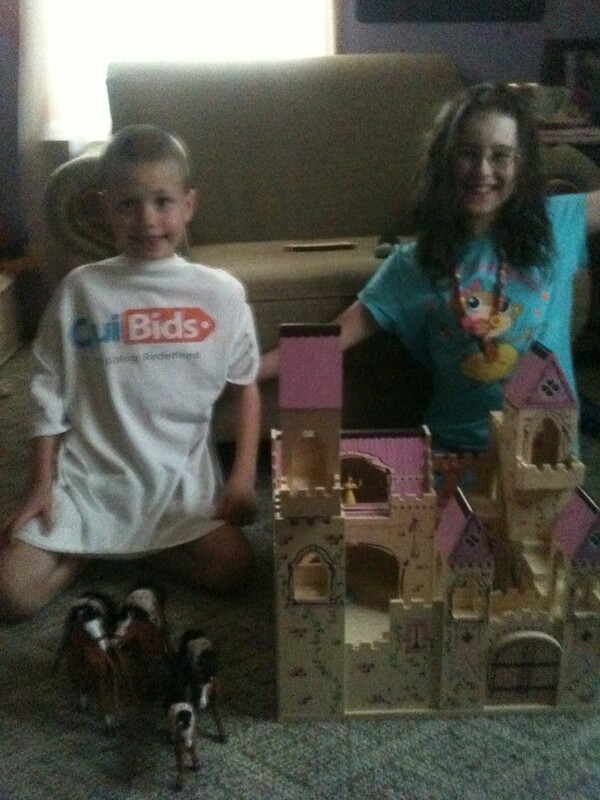 Won for $ .89 and 19 voucher bids.” – Karen C.
QuiBidder John S. definitely has a big heart. He loves winning toys on QuiBids and giving them away to a children’s shelter. There can never be enough of this kind of giving attitude. Thanks John for all that you do for children in need! “Was able to pick up a few more toys this morning to donate all with the free bid pack from the fan appreciation promotion. And I was bidding on my phone never the less which is no easy task hahaha” – John S.
“Toy #2 I won using the free bud pack promotion. Two great items to donate to the woman’s shelter for the kiddos.” – John S.
“Got some more toys today to donate to the shelter for Christmas.” – John S.
Below, read how Paula won a Kidorable Ballerina Umbrella for only $0.05. 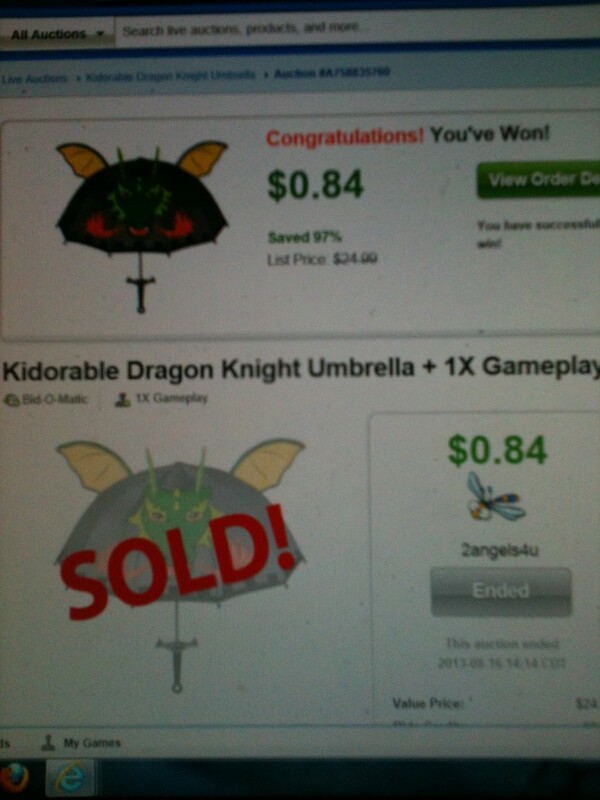 She was so pleased with it that she went after the Kidorable Dragon Knight Umbrella and won that too for $0.84! “‘KIDORABLE’ It was my first time seeing the brand name but these Umbrellas are far and above a average umbrella they are unique in there designs KIDORABLE makes the most incredible images and makes them into the umbrella a clever idea and well done. It comes for both girls and boys, Dragons,Dinosaurs and so many more winning it was great for 2 bids and also a 1x gameplay for FREE but my youngest fell in Love with it now my grandson is waiting for my Q clock to let me bid again so he can get a Dragon one they are worth it and those of you getting ready for Christmas gifts to put aside consider Kidorable because they really are ADORABLE!! !” – Paula B. “‘COMING OUT A WINNER WHEN THE ODDS ARE STACKED AGAINST YOU’… I had a great month with Quibids but my grandson was really upset that I didn’t win him a Dragon umbrella by “KIDORABLE” after seeing my youngest daughters!! 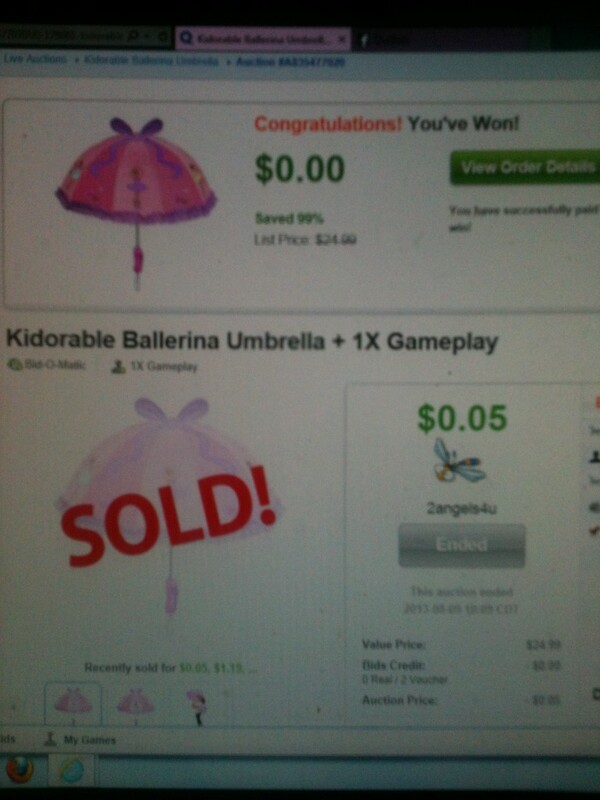 So I went to work and a good laugh with Customer Service I was at limit so I needed a limit buster and a win to have more bids so won a two time limit buster under .50 than won the umbrella he so badly wanted with a Gameplay with 5 bids.. WHEW boy was I putting everything I had learned over time and even did a refresh of Quibids 101 and took a breath and did it!!! Im not a PB my any account and after I won my bids from the gameplay ran into a auctions packed full of them so I ran and took my prize LOL.. Thanks to everyone on FB and CS for having a laugh and faith in me that I could pull it off!! As Im not one to limit bust.. Thanks Quibids (Mica.Kevin) and everyone here that’s cheered me on it wouldn’t be as fun without you all here on Quibids FB you know who you all are (Appy) Many Thanks” – Paula B. 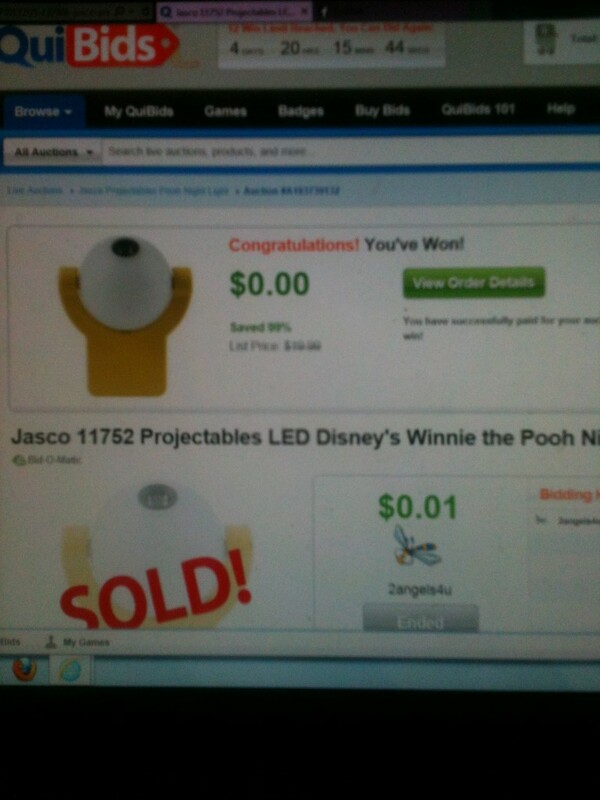 “New Item “JASCO PROJECTABLES” I won this for my daughter and didn’t give much thought to it but I have to tell you that this little night light PACKS A PUNCH it SHINES SO BRIGHT onto the ceiling and has Winnie the pooh and Tigger too lol and even in daylight you can see it very bright and really colorful its adjustable to move to different parts of your ceiling so don’t be fooled its no ordinary little night light its looks are deceiving its bright beautiful and ever so colorful so glad I won it for her cant say enough about it. Ive bought bigger lights that don’t shine nearly as close as the way this one does its really a awesome night light and worth going to auction for” – Paula B. “My Daughter and Grandson LOVE the NEW MELISSA & DOUG TOYS!!! They each picked a toy and I won the Horse set worth 27.99$ for FREE and the beautiful Princess Castle valued at 69.99 for 5.78$ plus a 1X Game play for just a few bids I jumped in at the right time and to top the day off as they cheered me on Go QuiBids I WON them a Cuisinart Ice Cream Maker valued at 59.99 for FREE and I LOVE A FREE WIN now the kids are just waiting for the ice cream maker to arrive!!! THANK YOU QUIBIDS me and my family had a blast” – Paula B.
Shirley’s grandson is so accustomed to her winning him stuff on QuiBids, that he now leaves her reminders to stock up on bids. Can you say CUTE?! 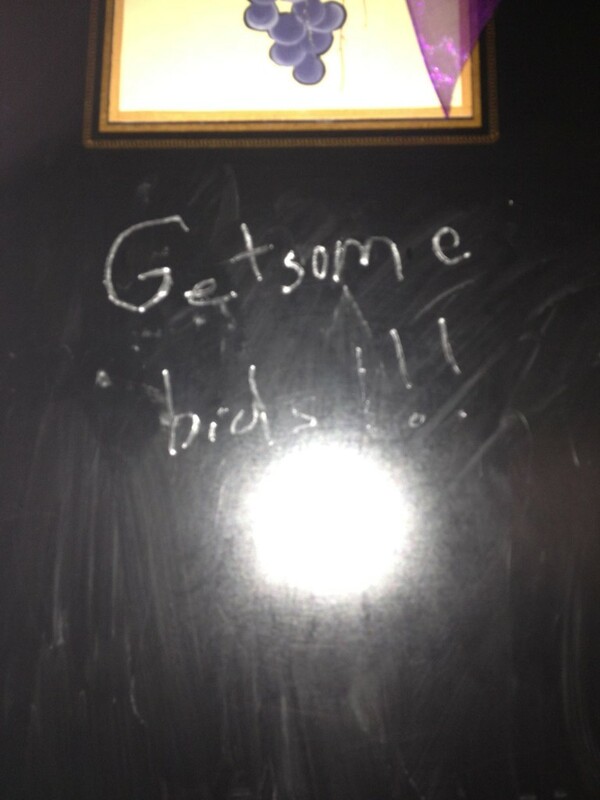 “Started to do laundry this morning and found a message on my chalkboard…guess my grandson wants me to get some bids??? 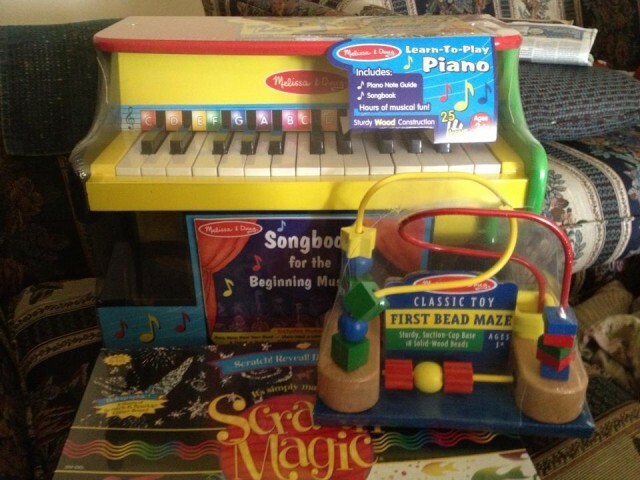 ?” – Shirley H.
Have you won a product on QuiBids that your kids love? Be sure to tell us about it in the comments, or you can leave a product review so other customers will know about your experiences with the item. Wanna see more kid stuff? Be sure to follow our For the Kids Pinterest board below. Happy bidding!